Artist Jody F. Sjogren has found expression for a diversity of interests in life through her art. Fascinated by animals, athletics, airplanes, and history, she credits her Renaissance mindset for her ability to view the world of aviation in concert with other facets of life. She has also been developing her abilities in calligraphic lettering, in order to use the written word as well as visual imagery to communicate her message. Her formal education reflected an attempt to integrate all of her interests into a career, as she graduated from Colorado State University with a Bachelor of Science degree in Zoology, and then from the Medical College of Georgia with a Master of Science degree in Medical Illustration. Within a short time after finishing her education, she started her own medical art business. 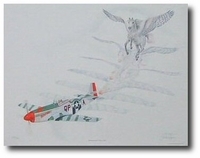 But the long-time interest in aviation and the desire for more artistic freedom soon nudged her into fine art. In 1983, she published the first of her “Metamorphosis” prints, depicting innovative transformations between winged creatures and aircraft. 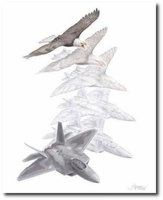 A subsequent series of her aviation art prints, entitled “Metaphors,” captures the namesake or essential spirit of an aircraft in a visual story. In each of her compositions, Jody strives to capture a touch of the imaginative along with the real. Her goal is always to involve the viewer in the process of artistic creation, and to encourage active consideration of the analogies between living systems and the machines of men. As she develops each painting, she researches all aspects of the image – biological, mechanical, historical, and literary – as thoroughly as possible. This attention to detail enables her to take her original inspiration from the initial concept to a finished image, which communicates personally with her viewers. Her print editions are published and distributed by Metamorphosis Studios and are also available through galleries around the United States and Canada. 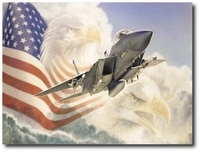 Collectors of her aviation artwork include many clients from the aerospace industry, the United States armed services, and NASA. 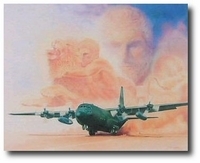 Her aviation paintings and prints are displayed in the Air Force Art Collection, in corporate offices, private collections, and public buildings worldwide. She is an artist fellow and past secretary of the American Society of Aviation Artists, and a member of the Calligraphy Guild of Columbus, Ohio. She is married to Jack Sjogren, a civil engineer and the sweetheart of her life. "Metamorphosis V: Man O' War"